If you’re like me, you’re missing working in the garden and the opportunity to paint in the garage or with the windows open. However since we’re in the dead of winter facing a new year, this is a great time to work on de-cluttering and reorganizing, starting with your laundry room. Before the clothes dryer needed to be relocated close to the washing machine, and the room was in desperate need of additional storage space. 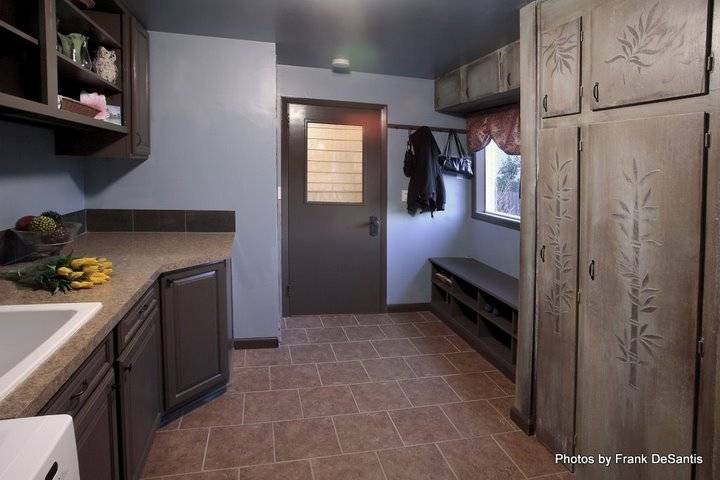 As you can see below, we added paint, new window treatments, new tile flooring, a new storage bench to hold shoes, plus hooks to hold coats and bags. 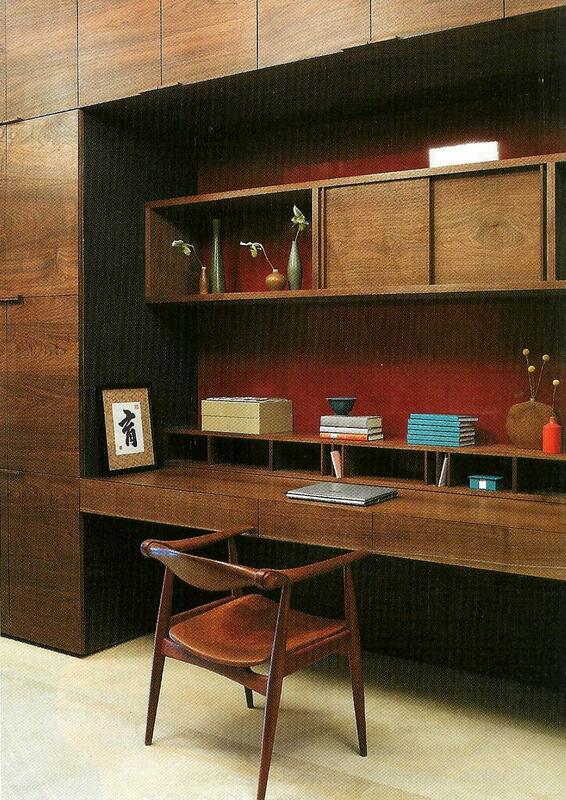 Additionally the existing cabinetry was faux finished by Johanna Annable , and we added new cabinetry to the other side…. 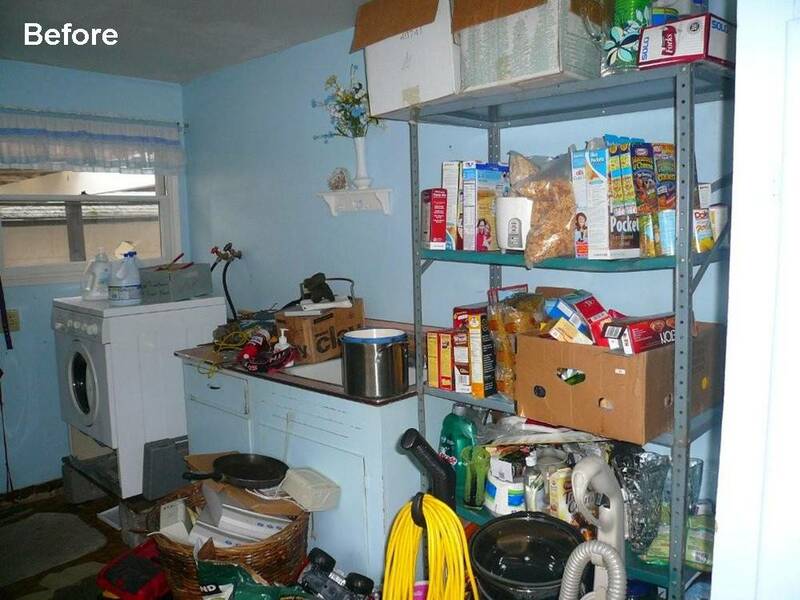 Before – over loaded shelving, an old utility sink, and the washer is separated from the dryer! This house was built in the early 1930’s. 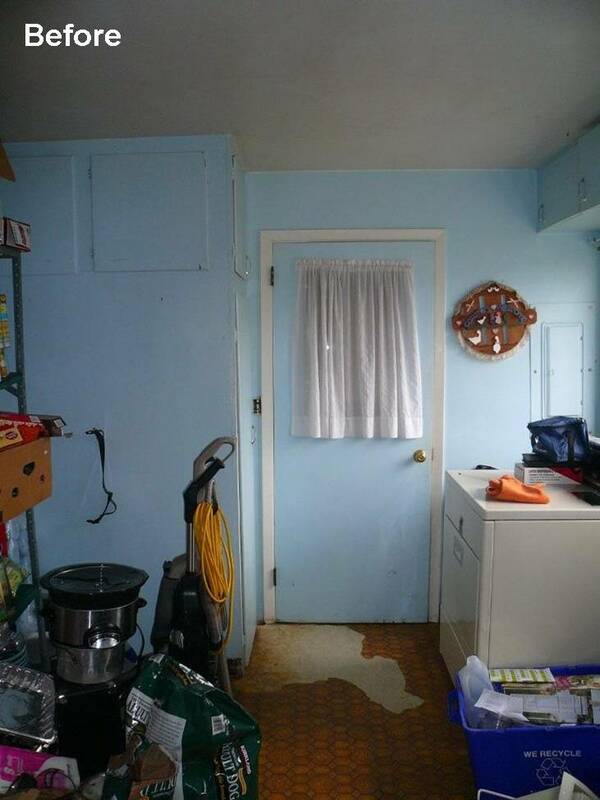 I love the large size of this laundry / mud room and the fact that it is closed off from the kitchen with another door. After – New coats of paint and extra storage make a huge difference. Above: It’s fun to dress up your laundry room with a gorgeous window treatment. We cut costs by using some leftover fabric from another custom window treatment project. We also saved by using painted cabinetry that we got a deal on because the cabinetry supplier had to take it back after it was originally produced in the wrong finish… a dark, ugly oak finish! We painted it and voilà, it looks fabulous! We also cut costs by using a laminate counter top and open shelving above the new cabinetry. Additionally, tile floors are a durable and cost-effective material to use, and this floor was done by Vinny Quattrocci, of Quattro Construction, Portland, OR. What do you think? I’d love to read your comments. 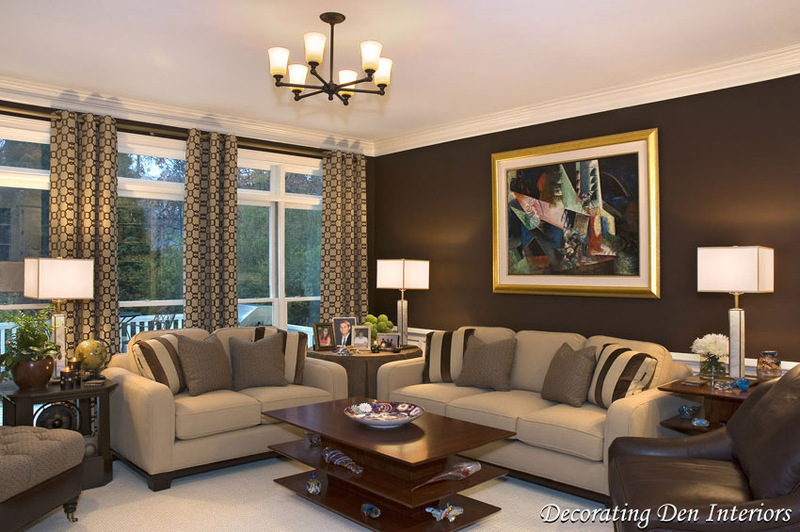 Also feel free to subscribe to this blog from the upper right hand corner and “like” my Facebook page at: http://www.Facebook.com/Decorating.Den.Portland. To see before and afters of the entire home makeover on YouTube click here. 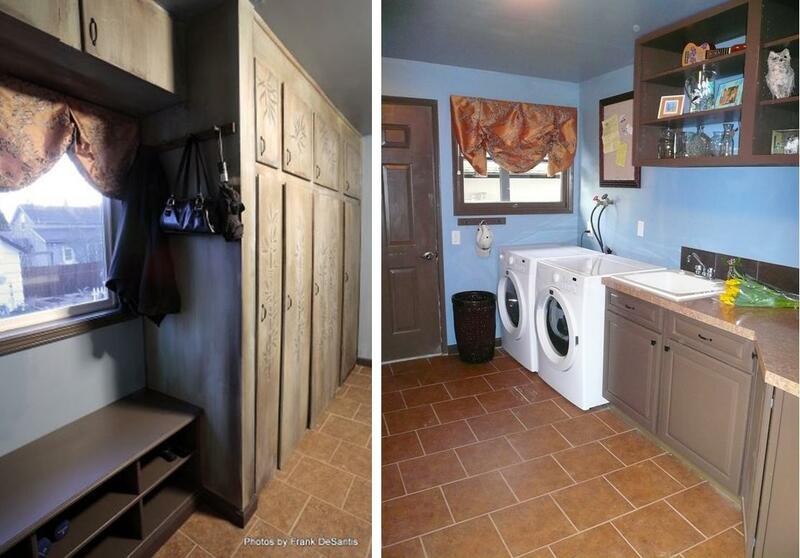 If you’d like to see more laundry room makeovers and organizing tips, check out this article from www.HouseLogic.com.